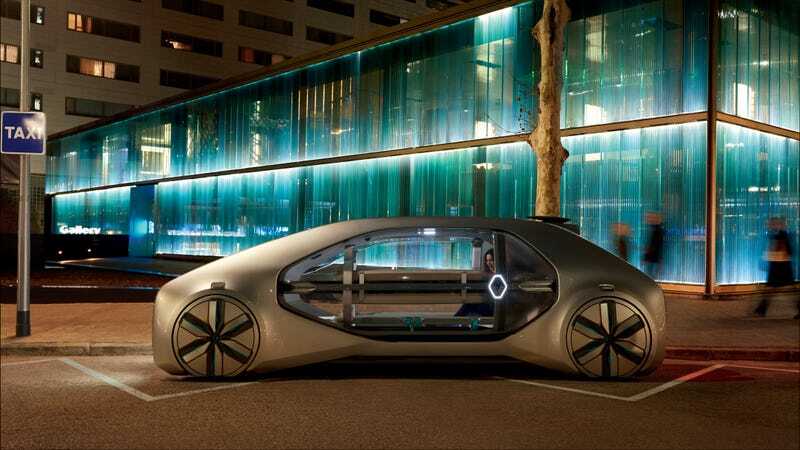 French automaker Renault has made its intentions with the autonomous driving world well-known, and at the Geneva Motor Show it showed how it might proceed into the future with an electric autonomous car called the EZ-GO. Calling it a “first of its kind” (though I can’t say I have any idea why Renault thinks that could be true), the automaker says EZ-GO is a concept both as a vehicle and a service that would allow passengers to hail a ride “either from a fixed or mobile location.” That means you could either use a smartphone app or a permanent standalone station. The lack of a safety operator may be striking, but the car is designed to only handle speeds up to 30 mph. So, in effect, it’s a taxi designed for city centers alone. The long cocoon shape gives the car a maximized field of vision, Renault says, so the car’s suite of autonomous sensors can see the road and safely drive around. The EZ-GO has a smart interior that’s ideal for the hypothetical driverless world of the future. The spacious interior’s outfitted with a U-like design for seating up to six, and, smartly, Renault planned the car in mind to be accessible to get in and out. Once the car’s at a station, a hatch opens up for passengers to get on-board or leave, and the flat floor it flush with a boarding ramp, making it wheelchair accessible. The car is a concept, but Renault says it wants to push this thing out by 2022, which tracks with comments made by CEO Carlos Ghosn. And when that time comes, Renault already has a stake in a (not kidding) media company that could entertain passengers with some form of content. That’s the future I want. Me, a handful of friends, sitting in a circle, while a pod drives us around and I read exclusively branded Renault content. Woo, yeah.